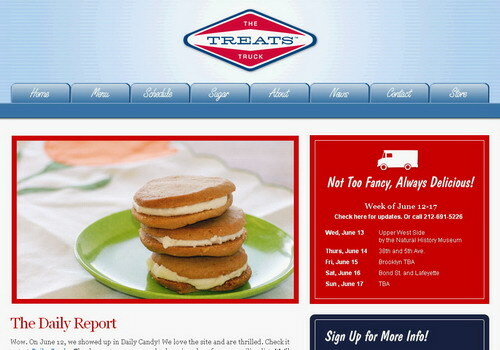 Just when you thought it was safe to go outside, along comes the Treats Truck. OTBKB conveys word of this innovation--a truck packed full of things that will break your diet and cause you to expand--that will be trawling the street of New York City with goodies for you. What's the Brooklyn angle you say? Well, for starters, Ye Olde Treats Truck is based in Red Hook. In addition, it is making its first Brooklyn appearance today, June 15, when it will be in the Borough Hall/Brooklyn Heights vicinity. The truck is described as a "bakery on wheels." The only saving grace is that it's highly unlikely it will be parked beneath your window for very long, as it's a big city and the truck has a lot of territory to cover. Read more over at OTBKB and, of course, over at the Treats Truck website.